Dispensaries; South Carolina; History; 20th century. Liquor industry; South Carolina; History; 20th century. Prohibition; South Carolina; History; 20th century. In The Coming of Southern Prohibition, Michael Lewis examines the rise and fall of South Carolina's state-run liquor dispensary system from its emergence in the 1890s until statewide prohibition in 1915. The dispensary system, requiring government-owned outlets to bottle and sell all alcohol, began as a way to both avoid prohibition and enrich governmental coffers. In this revealing study, Lewis offers a more complete rendering of South Carolina's path to universal prohibition and thus sharpens our understanding of historical southern attitudes towards race, religion, and alcohol. By focusing on the Aiken County border town of North Augusta, South Carolina, Lewis details how their lucrative dispensary operation -- which promised to both reduce alcohol consumption and generate funding for the county's cash-strapped government -- delayed statewide prohibition by nearly a decade. Aided by Georgia's adoption of dry laws in 1907, Aiken County profited from alcohol sales to Georgians crossing the state line to drink. Lewis shows, in fact, that the Aiken County dispensary at the foot of the bridge connecting South Carolina to Georgia sold more liquor than any other store in the state. Notwithstanding the moral debates surrounding temperance, the money resulting from dispensary sales helped pave roads, build parks and schools, and keep county and municipal taxes the lowest in South Carolina. The power of this revenue is notable, as Lewis reveals, given the rejection of prohibition laws voiced by the rural, native-born, Protestant population in Aiken County, which diverged from the sentiment of their peers in other parts of the region. Lewis's socio-cultural analysis, which includes the impact of adjacent mill villages and African American communities, employs statistical findings to reveal an interplay of political and economic factors that ultimately overwhelmed any profit margin and ushered in statewide prohibition in 1915. Original and enlightening, The Coming of Southern Prohibition explores a single community as it wrestled with the ethical and financial stakes of alcohol consumption and sale amid a national discourse that would dominate American life in the early twentieth century. 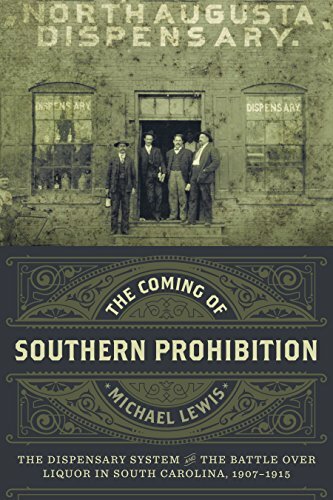 About: In The Coming of Southern Prohibition, Michael Lewis examines the rise and fall of South Carolina's state-run liquor dispensary system from its emergence in the 1890s until statewide prohibition in 1915.